Formula 1: Where does all the money go? How can a sport that generates more than £1.1bn per year in revenues have teams at the back of the grid desperately struggling to make ends meet? That is the question hanging over Formula 1 after both Marussia and Caterham went into administration, leaving the grid with only 18 cars - the lowest number for nine years. In many ways, though, it is the wrong question. After all, football generates much more money, yet leading clubs still get themselves into financial trouble. But there is no doubt F1 faces tough times, and the central talking point is whether the money is being shared in the right way. Other smaller teams, such as Sauber, Force India and Lotus, are struggling to survive, while larger ones live in a different world, of budgets of hundreds of millions of pounds, underwritten by huge global companies. Not according to the smaller teams, whose frustrations at the situation boiled over into anger at last weekend's US Grand Prix, with Force India's deputy team principal Bob Fernley saying they were considering boycotting the race in protest. That was never likely to happen, and although the word boycott is still being bandied about, it isn't likely to in the future either. Nevertheless, most in F1 recognise the sport is at a crossroads, and there are demands for the money to be redistributed more equitably. Talks are ongoing. So where does F1's money go? Which teams make the most money? Unsurprisingly, the big ones. Red Bull and Ferrari both have budgets in the region of £250m a year, perhaps a little less in Red Bull's case and a little more in Ferrari's. Mercedes' and McLaren's are a little less - at just under £200m. But in the case of both Mercedes and Ferrari, that figure does not count the money they spend on manufacturing engines, for their works teams and their customers. In Mercedes' case, that is another £140m or so. There is then a yawning chasm to the rest of the grid - with Lotus operating on something like £130m, and Williams, Force India, Toro Rosso and Sauber about the £100m mark, a little more or a little less depending on the team. Marussia and Caterham were reputedly getting by - or not, as the case turned out to be - on £70m and £60m respectively. Some teams are secretive about their finances, so some of these numbers are estimates, albeit informed ones. The teams' incomes are made up of two main revenue streams - prize money from the commercial rights holders, and the teams' sponsorship deals. Where does the prize money go? 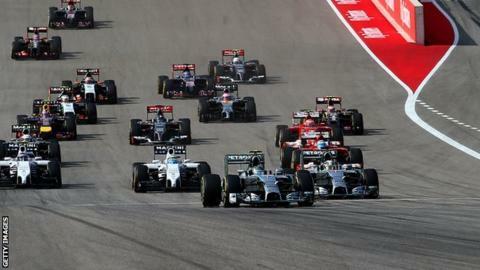 Of F1's £1.1bn income, 63% goes to the teams, the rest to boost the profits of the commercial rights holders (CRH). The main shareholder is a venture capital group called CVC Capital Partners; various banks and investment companies also hold shares. The contracts that define how the teams get paid are confidential and each team has its own commercial deal with the CRH. However, this is believed to be how it works. Bear with me, because it might make your head hurt. Just under half (47.5%) of the profit - about £500m in the last year of results - is split in half. One half is divided equally between the top 10 teams as defined by their results over the previous three seasons; the other is split between the top 10 from the previous year alone, with each position receiving a given percentage. The higher up you finished in the constructors' championship, the more money you get. There is also a separate pot called the constructors' championship bonus (CCB), which is about £187.5m and split between Ferrari, Red Bull and McLaren, with Ferrari earning by far the most. In addition, the two other teams deemed historically important and who also have permanent places on the rule-making F1 strategy group - Mercedes and Williams - each get payments of just over £18.8m. And £6.25m is given to each team not in the top 10 but competing in the championship. On top of that, before any money is divided up, Ferrari receive a bonus just for being in the championship, on the basis of the value their presence is perceived to give the sport. That is worth 5% of the revenues - 2.5% of the promoter's share and 2.5% from the teams' pot. This is about £56.25m this year. Does more success mean more money? As you can see from the structure above, yes, but with an important exception. Ferrari look like they will finish fourth in the constructors' championship this season. But the structure of the rest of their contract means they will earn more money from F1's income than Williams, who are on course for third, and possibly Red Bull, who will be second. How much does it cost to run an F1 team? How long is a piece of string? It depends on the level of the team's ambition. To have any realistic hope of winning races consistently and challenging for the championship, a team needs an income of at least £200m. But if you marshal your money wisely, put together an exceptional and well-focused group of people and have the right engine and drivers, it is possible to be competitive - in terms of qualifying in the first two or three rows and having a hope of perhaps snatching the odd win - on half that. Williams are proving that this year, as did Lotus in 2012 and 2013. But the lack of resources of those teams mean that achieving this alchemy is very hard (just look at Force India, who have the same Mercedes engine as Williams) and keeping it going is also very difficult (see how Lotus have plummeted this season as a result of a lack of investment/budget shortfalls in 2013). And lots of money is no guarantee of success if your technical department does a bad job - hence McLaren's appalling form of 2013 and 2014 after winning seven races in 2012. Are all the drivers millionaires? They most probably will be if they are in F1 for any length of time, but not necessarily in the way you might imagine. The very best are paid huge salaries and are rich beyond their wildest dreams. Lewis Hamilton's salary at Mercedes is £19.3m per year plus bonuses. Fernando Alonso is reputed to earn well over £15m - and possibly as much as £21m - from Ferrari. Sebastian Vettel will not be far behind, if at all. And Jenson Button is on a reputed £12.5m at McLaren, possibly more. Daniel Ricciardo won't be there yet, but the way he has driven this year means he will surely soon join that elite group. World-class talents such as these earn these sorts of sums for years on end, guaranteeing a sumptuous lifestyle for the rest of their lives. But, just as with the teams, the chasm down to the next level is huge. The second level of drivers - the likes of Romain Grosjean, Nico Hulkenberg and so on - will be on a few million. Newer recruits, even those there on the basis of talent alone and in established teams, will earn less again. Valtteri Bottas, for example, is believed to be on a couple of million at Williams; Kevin Magnussen a few hundred thousand at McLaren. Argentine Juan Manuel Fangio was a five-time world champion in the 1950s, but he would probably never have made it to Europe without the backing of Juan Peron's government. And then, reflecting the financial troubles of the smaller teams as a whole, there is a substantial number of drivers who pay for their seats, although they all earn a salary of varying sizes out of that figure. The biggest payer is Pastor Maldonado, who takes a budget of £30m to Lotus - as he did to Williams in 2011-2013 - courtesy of his backers, the Venezuelan state oil company. Swede Marcus Ericsson, who bought his way into F1 with Caterham this year, has earned a Sauber drive for 2015 on the back of a reputed £15.7m budget from his personal sponsors. The struggling Swiss team are expected to make a decision about who drives their second car based largely on the funds he can bring as well, with their Dutch reserve driver Giedo van der Garde tipped for the seat. Of the current grid, at least five drivers owe their positions to financial backing in one way or another. And if Marussia and Caterham still existed, that number would climb to nine - although in Jules Bianchi's case, he is at Marussia at the behest of Ferrari, who provide the team with engines. As ever in F1, money makes the wheels turn. And without it, everything comes to a juddering halt.